This was a special movie. It was powerful, gripping, emotional, and it makes you reflect. Director Paul Haggis is on a role. From his Academy nominated screenplay for Million Dollar Baby to directing Academy Award winning Crash, he now brings us this gem with subliminal messages that say "Oscar again" all over it. With a cast that includes Oscar winners Tommy Lee Jones, Susan Sarandon, and Charlize Theron, you better believe that this project is Oscar worthy. Mike, a soldier that recently returned to the States after his duty in Iraq, has gone AWOL (missing). After being told of the situation, his father Hank Deerfield (Tommy Lee Jones), a war veteran and former MP, goes off to find his son. He leaves his wife Joan (Susan Sarandon) at home and eventually turns to police detective Emily Sanders (Charlize Theron) who helps him with his cause. Together they discover the truth which is just a disturbing as war itself. The characters in this movie were average folk, as it should be. The performances were far from average though and very real. Mr. Jones stands out in this picture. At times he was good ol’ Tommy with his quick, sharp wit and line delivery, but overall his role was dramatic and strong like a true soldier. As simple as the storyline seems, the movie had plenty of twists and turns. At some moments I questioned if this movie really had anything to do with the war in Iraq. One of the underlying themes of the movie, however, was constant . . . PTSD (post traumatic stress disorder). In simple terms, what could happen to a soldier’s mind after experiencing the trauma of war. A similar trauma is felt by the parents and family of these soldiers. Joan says it best as she asks one of the military authorities at the base, "Do you have any children?" It’s more than what she asked; it’s also how she asked. I was the guy that asked for your card after the movie...'In the Valley of Elah.' Nice website, btw. I figure you have got your review pretty well in hand...or your mind. Just thought I'd tell you some of my perspective if you are interested. I was in Iraq for a year, during the same time frame as the movie. I was with the 101st, and have been from one end of the country to the other. I didn't experience anything like the movie. I have a lot of friends in the military that are there now and have been there since I was there. I have friends that went to Afghanistan and who are there now as well. No one has experienced things in the way the movie portrayed. Yes we've seen a lot of things that we'd like to forget and done things that we might not have wanted to; but not quite the way the movie portrayed. I thought the movie was put together well, I thought the mystery was interesting. The acting was great. The shots of Iraq and the military uniforms were very accurate. With the majority of society looking for some sort of insight to understand what they haven't experienced or cannot experience, they rely on visual media through the news and cinematography. I felt it was unfortunate that the movie seemed to be making a political statement; and it is unfortunate that it leaves the military in such bad light . . . I just hope that the audience doesn't look at the movie as the norm for returning soldiers. Thank you so much for this email. Who better to get an opinion from than someone who was actually there? Since I don't have the experience you have, and I'm not fully informed on 'all things Iraq', I go based on the movie itself. 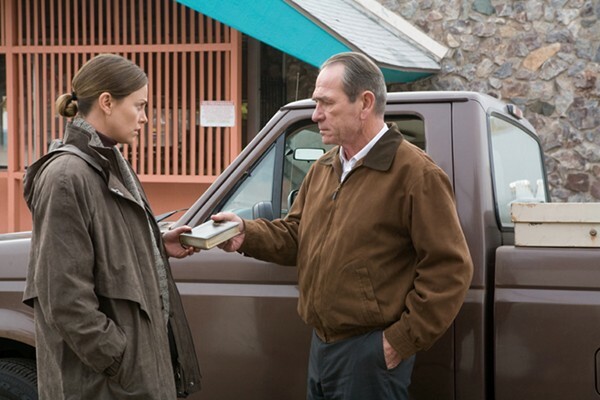 I thought it was very good as well with compelling performances by Tommy Lee Jones and Charlize Theron. Even though this is probably an isolated case like you say, it was a good production as far as the movie is concerned. There is a lot of Oscar buzz around this movie. I'm glad to hear that this is not the norm for soldiers. Thanks again for this email. I truly believe that many U.S. citizens take a lot for granted. Movies like Saving Private Ryan, Black Hawk Down, and now this one, have helped me realize just how much we take for granted. It has given me a whole new appreciation for all war veterans and military personnel. We need to be grateful of the fact that while we sit here nice and cozy in our homes living our daily lives, thousands upon thousands of men and women like yourself are sent abroad for such long periods of time under hellish conditions to defend our very own way of life. It is such a shame that we are in a world where mankind cannot live in peace. So thank you, thank you very much for all you have done for me, for the people of this country, and for this country in general. God bless you and your family and all people that fight for us. The title of this movie refers to the valley where David fought the giant Goliath. Similar to that battle, there are so many battles going on daily between countries, between governments and their people, between the people themselves, and within us as well. I would like to dedicate this review to all soldiers that are struggling with these battles. I loved this movie, saw it three times. It made me realize just what our soldiers are going through, daily, and throughout their lives, while they have fought in an unnecessary war, for us and our country. The actors couldn't have been better, and were perfect for their roles. It stayed with me for awhile, and couldn't sleep the first night after watching it.